Eek welcome back to #LoveNortEast can you beleive it's February? Spring will be knocking on our door before you know it! 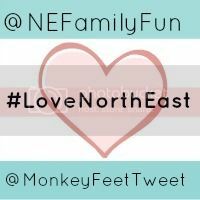 Thankyou to everyone who joined in with last month's #LoveNorthEast - we loved reading all of your posts and hope you link up again this month. I'd love to see even more of our brilliant local bloggers so please help us spread the word. 1 - Add our badge (copy and paste the code below into the HTML of your blog post at the bottom. If you are confused - just ask and we'll do our best to help). Alternatively, you can add a text link to this post or Sam's #LoveNorthEast post at the bottom of your blog post so people know where to find us. Bloggers that don't play by the rules will have their posts removed. Sam and I put a lot of work into promoting NE bloggers and blogs and it only takes 2 minutes to follow the above steps and keep us happy. #LoveNorthEast will open on 1st of each month for 10 days. Grab our badge and then add your link to the tool below.